Back in the 1980’s we had Dinosaucers, an animated TV series about warring tribes of anthro-dinosaurs who bring their battle to Planet Earth. 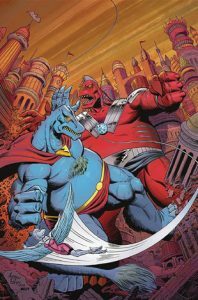 (Not fooling anyone: The series is known these days mostly for its rather… rich dialogue writing…) Well now the original creator of Dinosaucers, Michael Uslan, has returned with a new Dinosaucers 5-issue comic book mini-series — illustrated by Andrew Pepoy and published by Lion Forge. “Reptilon has just found its sister planet-Earth-complete with water, fauna, and a billion pieces of meat. The Voyager has been peacefully traveling through space for years when, unexpectedly, it’s attacked by an alien, laser-shooting space shuttle. The attackers? Fully evolved, advanced humanoid dinosaurs who’ve destroyed their home planet and are now on the hunt to commandeer a new one to expand their empire.” Several issues are on the shelves already.